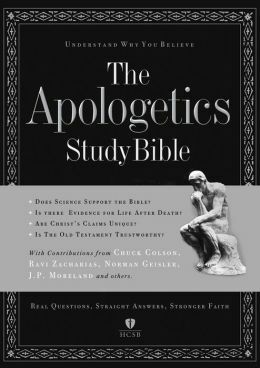 The Apologetics Study Bible will help today's Christian better understand, defend and proclaim their beliefs in this age of increasing moral and spiritual relativism. More than one-hundred key questions and articles placed throughout the volume about faith and science prompt a rewarding study experience at every reading. Highlights of this new thinking person’s edition of God’s Word include the full text of the popular Holman CSB® translation, an introduction to each Bible book focusing on its inherent elements of apologetics, and profiles of historic Christian apologists from Justin Martyr to C.S. Lewis. Also featured are valuable contributions from a who’s-who of modern apologists such as Chuck Colson, Norm Geisler, Hank Hanegraaff, Josh McDowell, Albert Mohler, Ravi Zacharias, and many more.